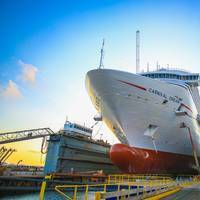 Caribbean shipyard Grand Bahama Shipyard Limited (GBSL) said it will complete work on 10 cruise vessels within first quarter of 2017. Scope of works included significant propulsion and technical systems overhauls, hull treatment, accommodations and public spaces upgrades and the addition of onboard attraction facilities. 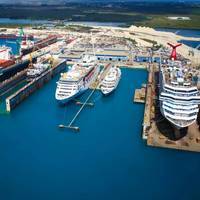 GBSL shared highlights of 10 of the 23 cruise vessels owned and/or operated by major players in the industry planned for dry-docking in the first quarter of 2017. 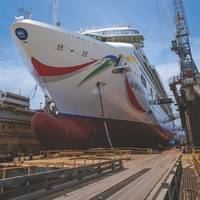 The Caribbean shipyard Grand Bahama Shipyard Limited (GBSL) worked on 49 commercial vessels and 20 cruise ships throughout 2016, with scope of works ranging from major steel fabrication and repairs, to engine and technical systems overhauls, hull treatment and tank cleanings. And looking to 2017 and beyond, the yard reports it has a healthy order book, with docking periods secured as far ahead as three years. VShips USA brought two bulk carriers, CSL Acadian and CSL Argosy, to GBSL to do tank cleaning on both vessels. CSL Acadian also received extensive pipe work. 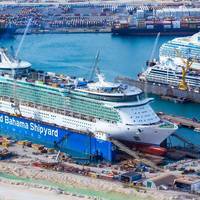 Caribbean ship repair yard Grand Bahama Shipyard Limited (GBSL) reported a busy 2016 for retrofit, refurbishments and repairs to vessels from the leading cruise lines. GBSL said it performed work on 20 cruise vessels during 2016, with scope of works included significant propulsion and technical systems overhauls, hull treatment, accommodations and public spaces upgrades and the addition of onboard attraction facilities. The trend continues: for 2017, GBSL has confirmed 23 cruise vessels scheduled for refit, refurbishment or revitalization from its customer base. MR spent time with Graham Couser, VP of Sales and Marketing, Grand Bahama Shipyard Ltd. (GBSL), for updates and insights on how this yard is faring in the current market and investing for the future. 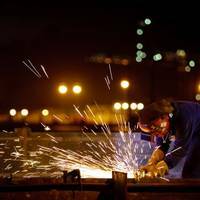 As the largest ship repair yard in the Caribbean, Grand Bahama Shipyard Limited, Couser said the yard is committed to continual investment based on customer’s needs, in markets good and bad. “The cruise market remains buoyant and upbeat with growth planned into the next few years,” said Couser. Grand Bahama Shipyard Limited (GBSL), a shipyard in the Caribbean, said it had a productive summer program consisting of work on vessels from the tanker, container and towage segments of the maritime industry. Additionally, renovations and upgrades were performed on the floating dry docks and workshops, all in conjunction with yard improvements in anticipation for a busy fall and winter work period. The summer saw the yard busy with repeat customers from respected players in the tanker, container and towage segments operating in the Caribbean region. Harris Pye Engineering has announced the recent alliance with Grand Bahama Shipyard Ltd. The two companies met in Miami at the Cruise Shipping Exhibition and discussed a working relationship earlier this year, which was continued through further discussions during OTC in Houston. Through this alliance Harris Pye Engineering are able to offer the full range of technical capabilities - from design to full project execution, whilst the Grand Bahama Shipyard are able to offer its facilities as well as labor and management, enabling both parties to offer a permanent presence within the region. "We share a strategic vision," said Graham Couser, SVP of the Grand Bahama Shipyard Ltd upon the announcement of the signing of a cooperation agreement with Harris Pye. 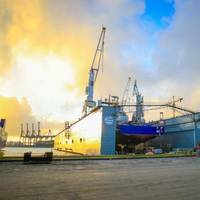 One of the largest exclusive ship repair fleet agreements in Caribbean history, worth more than $10 million, signed between GBSL and Crowley which will extend to mid – 2017. 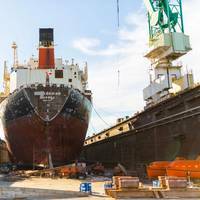 Grand Bahama Shipyard Limited (GBSL), the ship repair and refurbishment yard in Freeport Grand Bahama, Bahamas has signed a ship repair fleet agreement with Crowley Maritime Corporation for a maintenance program for 23 vessels over the next 12 months. The agreement, worth more than $10 million, will see GBSL dock and upgrade these vessels exclusively at the shipyard.